Hals has successfully depicted the realistic aspect of the banquet to a new level that breaks conventional structure in portraying the subjects as they really are. His use of paint and painting style is unique as we see an array of flesh tones and hues creating an atmosphere of joviality. The subjects are also active in the viewing process; they are aware of the viewer's presence and continue to enjoy the feast before them. We gain an insight into what some of them were like; some humbled, calm, talkative and expressive in their body language. The compositional qualities of this piece are its most striking aspect and it is noted for the harmonious flow between the subjects. 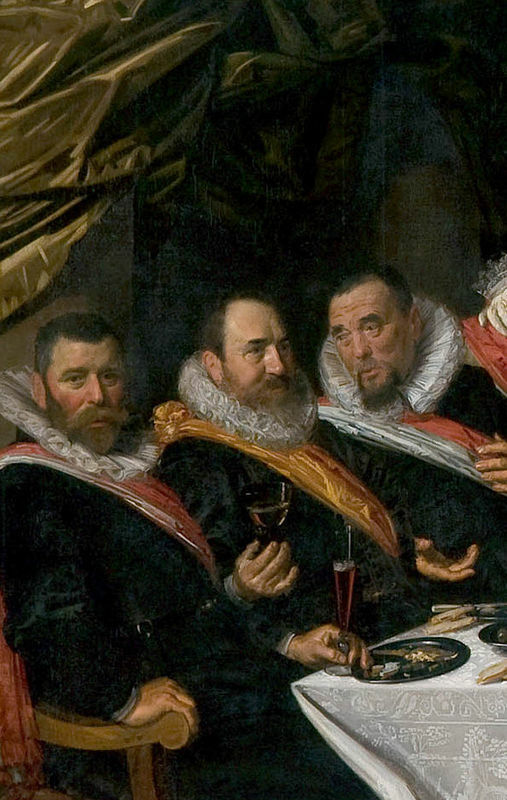 It is debated that Hals has created a "Last Supper" effect in this group portrait. Yet, unlike the Last Supper images, his subjects are aware of his presence. 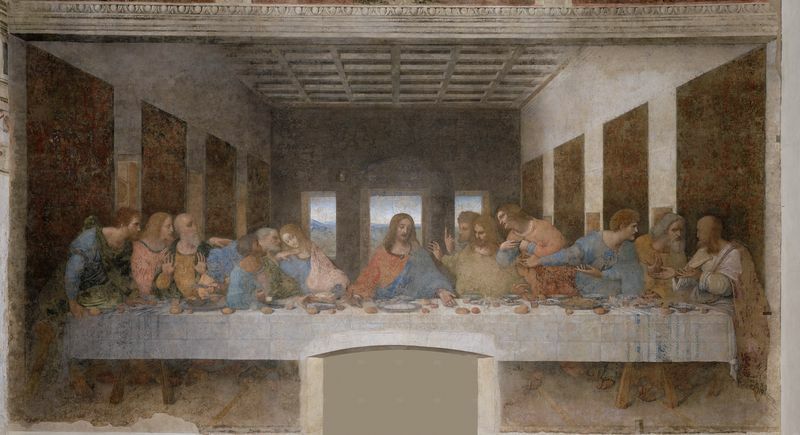 Furthermore, he improves the Last Supper compositions by creating depth as sitters are placed to the front and back, giving a more realistic impression of the event and breaking away from the linear view. Hals places the subjects in varied positions, standing and sitting which results in a three-dimensional aspect and conveys a sense of bustling activity. We see one of the officers to the far left looking beyond the picture, giving the image a greater spectrum and leaving the viewer guessing at to what lies beyond what their eyes can see. 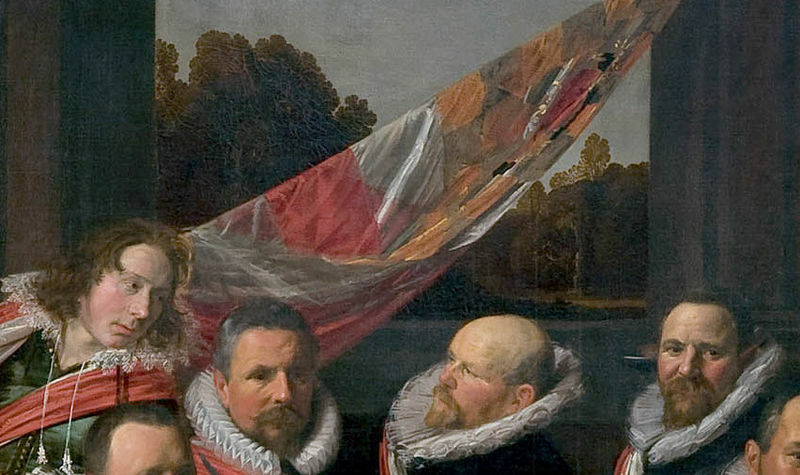 To reinforce status in Banquet of the officers of the St George Civic Guard, the more important officers were placed to the front and middle but this technique not only fitted in with the demands of Hals' commissioners but also made the image more aesthetically pleasing. The bodies form a circular shape which leads the eye around the canvas and results in the viewer acknowledging each of guards individually. 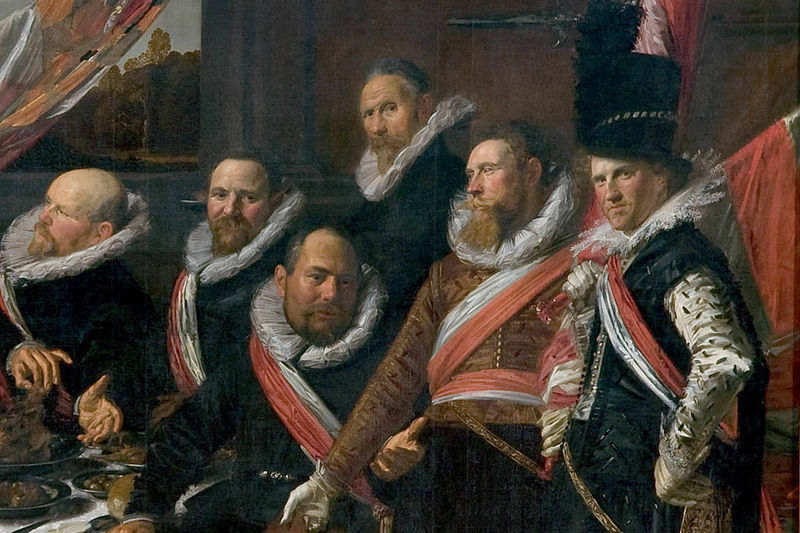 Some of the guards gaze directly at the viewer, engaging us in the piece and allowing us to imagine what it was like for Hals standing before the banquet himself. Hals uses quick, loose strokes of bright colors that are typical of his works from this period. Color helps define the presence of the light in the room and is used to structure the objects and textures, creating a warm and inviting atmosphere. There is bold use of bright oranges and dull reds in the image in the flags, clothes and furniture as well as flesh tints in the subject's faces. Light browns are used to define the volume and textures in the curtain in the background and also create shadows in certain areas of the canvas. It's thought that Hals did not sketch his subjects first but instead painted everything directly onto the canvas. The various subjects would come to his studio and he painted them, adding in their heads and faces last. Hals made few alterations to the final product. When it came to groups portraitures Hal's subjects were always engaged in some form of theatrical scene that created a bigger narrative. Banquet of the officers of the St George Civic Guard in particular shows the subjects in high esteem, befitting their regimen and status but also provides a glimpse of the men behind the titles. Hal's incessant daubing and layering creates an overall movement in the characters gestures and also adds depth, volume and texture to various surfaces.